There are conflicts between tourism development and nature conservation in South Antalya, Turkey, in terms of land loss and changes. 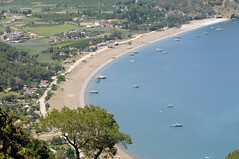 It is revealed that borders of the Olympos-Beydaglari National Park occupying 69?800 ha have been reduced down to 34?425 ha with the exclusion of Beldibi, Göynük, Kemer, Çamyuva and Tekirova where great changes occurred from agriculture and forest areas into organized tourism areas and settlements within 865 ha in Beldibi, 1030 ha in Göynük, 4035 ha in Kemer and 1115 ha in Tekirova. Changes in forest areas led the loss of ecologically important areas particularly in the coastlines while changes in agricultural areas end up with the abundance of traditional land use patterns and the opening of agricultural areas for tourism development.